• Intrinsic movement of the smooth muscle in the organs and vessels. • Extrinsic movement – how we move ‘voluntarily’ every day. Diane, what do you think about these three types of movements in relation to the ABR – aren’t we able to improve them all with ABR – are we? 🙂 Have you heard any discussion about what kind of a relationship or an interconnection there would be in between these three types of movement? Hello S.– Thank you for this question! Yes, ABR is able to address all three types of movements described above by Tom Myers because the ABR applications achieve their positive effects by initiating a step by step reconstruction of the bodies intrinsic Biotensegral base of stability. Through building and/or rebuilding or improving the intrinsic architecture of the body – which is of course also “Embryonic” in nature due to the fact that the internal mesenchyme related tissues first appeared during our embryonic development – this then allows for and improves the other three types of movement described above. On the other hand, when the body is without or is lacking in a sufficiently intrinsically stable architecture, then those three characteristics of movements described by Tom Myers are impaired. The body cannot sufficiently exist in a spatial dimension, it collapses either fully or partially and this internal weakening or collapse effects the three described movements. 1. “Embryonic Movement” is impaired because the “spaces” necessary for the flows of fluids or for the movements of cells does not exist sufficiently. The fluids cannot penetrate and infiltrate the tissues in a manner that would keep the tissues adequately healthy and thriving. 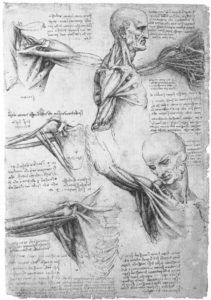 The tissues of the body begin to “fall in upon themselves”. They become “stiff”, fibrotic, dense, under nourished – in the end – we can redefine the meaning of “spasticity” simply by understanding what occurs when the movements of the fluids in the tissues is impaired! Contractions and distortions of joints are the obvious long term result of insufficient Embryonic Movement quality. In the case of a brain injured child, even if the brain would be in good enough shape to actually maintain the health of the tissues once it is there, the body simply cannot achieve enough momentum to penetrate tissue areas of the body that have been partially shut down from the fluid flow. This is one of the main effects of ABR applications: Restoration of the flows of liquids within the tissues which in itself has a tissue remodelling effect which works to release spasticity, strengthen weak joint capsules, and attain the next level of improvement of architectural stability. 2. “Intrinsic Movement” – Tom Myers describes intrinsic movement here as the movement of the smooth muscles. From the very early days of ABR – this has been a central goal of the techniques: To improve the quality of the smooth muscles of the lungs and the other internal organs. Palpitations of especially severe children reveal how “empty” the volumes of these children are internally. One can often grasp the vertebral column through the abdominal wall! This is a sign of extreme depletion of the internal organs. They are also “dried out”, under developed and functioning at a very low level. ABR would not have such a good success in helping these individuals, if it were not for the fact that one is able with the various abdominal and thoracic techniques to raise the functional level as well as the tissue quality level of the smooth muscles! It is through these effects that we consistently see reduction of mucus, colds and pneumonias, improved respiratory capacity, improvement of reflux and constipation issues, – the list is long. This brings the children a much higher level of life functioning which also in turn boosts the fluid movements described in #1 above. The body is a highly interwoven system! If one can achieve improvements of #1 or #2 then these improvements are immediately systemic in nature and bring all the surprising effects of improved concentration, attention, awareness, which also emerge with the application of ABR. 3. “Extrinsic Movement” – This Tom Myers describes as our voluntary movements. Of course, this is what all parents want to achieve and how the parents base their evaluation of whether ABR “works” or not. “Has my child achieved a better functional level with respect to either sitting, rolling, crawling, standing or walking. It is however obvious that without achieving improvements in #1 and #2 above, there will be either severe or less severe limitations to what can be achieved by the child in respect to his voluntary movements. It is therefore that ABR concentrates on #1 and #2 above in order to achieve the improvements in the Extrinsic Movements. 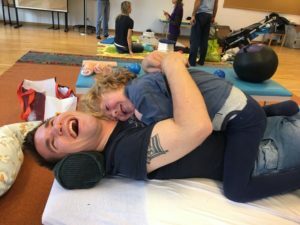 And it is also therefore that parents need to understand the sequences and the connections between the deeper lying weaknesses of their children and the emerging functional levels of the Gross Motor Function. When the flow of the fluids to the tissues is inssuficinet, then the result is that the tissues become dried out or too dense. This becomes then a negative cycle with either larger or smaller areas of the body that cannot be sufficiently penetrated by the fluid exhcange system! Improvement of the flow, the improves the tissue remodeling. 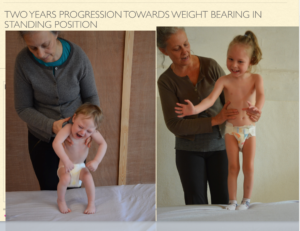 Improved quality of the tissues, improves the level at which the child can then utilize the body for the extrinsic movements. With ABR Patience and Time is necessary in order to attain the desired improvements, but these improvements can be achieved when the tenacity is present! In the last years ABR has developed an enormous selection of applications all which directly promote the quality of the extrinsic movement level. These include the wraps, the osteo-tapping and also the PAVE (Peri-Articular Visco Elastic) applications which have been showing great effects for many years. Yes – we enthusiastically confirm – there is a dynamic interconnectivity between #1. #2, and #3 described above which the ABR Method seeks to promote with as many techniques and accompanying suggestions as is possible. I look forwards to any discussion or further questions about the above from the families! It is Summer time now and we enjoy basking in the warmth! As lovely as it is for the brain injured child to experience the warmth of the Sun on his or her skin and to be outside without extra clothing – this time of year can present even extra challenges if the parents are not attentive! 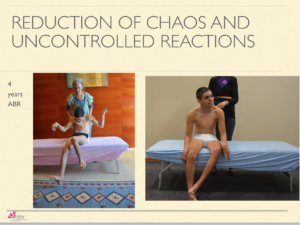 The post below is not only important in the Summer but it may be one of the most important piece of information that you need for the optimal care of your CP child. It can be immediately implemented as well. The parents of thousands of children with brain damage have told us: The child does not like to drink – and especially not water. For the ABR Accessors who do the children’s evaluations – this is not a surprise. Moreover the “song and dance” routines that some mothers and fathers have thought out in order to try to get their children to drink anything at all can be very amusing to hear – but it is not the main proportion of the parents who have developed these hydration routines with success. Unfortunately most parents will tend settle at the thirst level of the child. The main thing that parents of a brain injured child need to keep in mind, is that once the child’s body is dehydrated, he or she does not feel thirst. So it is incredibly important that in respect to water intake and hydration, the parents do not feel inclined to “follow the child”! Most parents will simply do this – and this is of course natural. These children have so many problems and the refusal to drink seems to be rather small one in respect to the other difficulties on hand. But especially in the case of hydration, the parent has to know that he or she knows best – and much better than the child! Only the parent can regulate the intake of water for a child and especially for one who is certainly already dehydrated. Water is the foundation for all life and it possesses dynamic qualities! The parent needs to know and remember that water and liquid flow is the basis for all of the life processes taking part in the child. At the same time, even a slight dehydration has an enormous cascade effect upon the entire bodily system! When dehydration occurs and the overall water volume in the body is reduced: this then results in a reduction in the central blood volume and, therefore also in skin blood flow! The decrease in the blood volume then causes a compensatory increase in the heart rate, which is then again followed by a decrease in stroke volume. This is due to the increased heart rate and decreased filling time for the heart! Remember that the heart beat rate increases! Many children with CP have tachycardia. Before giving the child pharmaceutical drugs for this condition – try to bring up the hydration level! Water is essential for all of the life processes. It is important to realize that the flow of the fluids within the tissues together with the capillary flow is the essential tissue stimulation required for all tissue regeneration and tissue renewal. This fluid exchange movement known as “liquid shear” has a positive remodelling effect upon the tissues. When the tissues dry out and the pathways for the more capillary located blood flow decrease, then the tissues will of necessity be locked into a process of slow and steady degeneration. For a children with movement disorders the systemic reduction of tissue fluids is one of the leading factors which reduces the child’s general performance. It is also responsible for an increase in joint stiffness and spasticity! Enough written about the importance of water intake! We could continue with many more aspects but the parents and caretakers should be able to see the connections between sufficient water intake and their own child’s health and development. The colour of the urine is the most significant sign. Instead of being a light greenish yellow, it becomes bright orange yellow or worse yet dark yellowish amber brown. When the colour of the urine is in this range it is a sign that the child has much too little to drink. If the child is using disposable nappies, it may be difficult to discern the colour. Here also the parent needs to be creative and perhaps use a cloth nappy in order to see the colour. If the child smells badly (and many children with CP have a bad smell) – this is also not a good sign! Healthy hydrated children do not smell. Dizziness and headaches. Most children will not be able to express anything about this, but they may certainly being having these symptoms. Six weeks later we met for a further assessment before the family started with the ABR training. At this meeting we found out that the mother had taken the recommendations we had given her to take the drinking seriously and had tried to increase the water intake up to at least one liter per day for a child of her small size. The mother was fortunately able to get the girl to drink consistently. Most amazing however was the long list of improvements that the parents told us about that had came about spontaneously during these short weeks simply through increasing the water intake! The child started sleeping through the nights. She was much less restless during the day as well. The child began to be able to swallow and to chew almost normally!. The time taken for the meals was down to a normal time for a meal so that the child is now finished eating together with the parents. The seizure level decreased significantly and seizures almost disappeared. This story illustrates the extreme importance of good hydration for children with cerebral palsy. The parents need to be encouraged to pay attention to hydration at all times! Not one day should go by when the child has too little to drink. If the child has been dehydrated for a long time – and this is the case of most children with brain injury – then it cannot be expected that thirst will simply be present. The cells within the body have been used to a minimal liquid exchange. It will take time for the introduced water to begin to move consistently through the system – but do not give up! You need to be consistent and will also need to develop a strategy. Offer the liquids at least once each half an hour. In this way the child will become used to having liquids in his body. If there are issues with getting the fluids into the child’s mouth, try using a variety of cups, bottles, syringes or even spray bottles at first. If the child refuses to drink, try using a syringe and find out where to bring the water into the mouth so that the child does not choke but can swallow it. Or use even a spray bottle and simply spray the water into the child’s mouth. Make a realistic goal for increasing the liquid intake on a week-to-week basis. Increase by ca. 100 ml each week until one achieves the wished for daily water intake. Taste can be important. If the water has some taste then the stomach will automatically react in such a way as to facilitate swallowing. If the child simply refuses the water, then add a bit of non-sweetened juice or some soup broth. Taste can be important assistant in swallowing and it may be necessary in the beginning to add something that has some taste. Every parent of a special needs child lends a particular notice and emphasis upon what is happening with the hands and the feet of their child. On the one hand this is due to the fact that these are the most obvious areas of the body – they stick out! If the feet roll inwards, if the hand is shriveled and not useful for grasping objects, eating and playing – well then the parents and the therapists as well gather around this hand or foot. They try to stimulate the child to use it better, try to stretch it, try to massage it – anything to try to bring it to usage. The ABR Method takes an entirely different avenue. First of all one works on understanding and recognition! One tries to go a few levels deeper into the evaluation of the difficulty of the “hand” or the “foot” itself – in following the present example. What does a shriveled hand show us? The hand always leads back to the shoulder girdle and the neck. 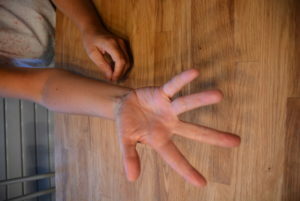 When one sees a shriveled or a hand with contracture there is no doubt that limitations can be found higher up in the vertical connections of the neck and spine. When the cervical spine is weak, then it needs to start to use and mobilize the arms and hands for stability. The arms then take over as stabilizers because the most important thing that needs to be done is to protect the neck and keep the head stable. As soon as one recognizes that even an otherwise healthy child who runs with one or both arms bent and held close to the chest is doing this to protect the less obvious weaknesses in his neck – then the strange positions of the arms and hands of children with cerebral palsy and related conditions can be recognized for what they truly are at a deeper structural base: They are all the natural attempts to protect and to stabilize the weak connections between the head and the neck. Or: If my head wobbles, because my neck is weak, I can then create stability for the neck by blocking the long horizontal connections of the arms that would otherwise create even more chaos for my wobbly head. Instead of allowing the horizontal connections of the arms to simply ruin any stability I can find in my neck, I will recruit them by blocking them to add some stability to my weak vertical neck connections. This is the basic understanding of the shriveled hands, the folded hands, and the turned in feet. 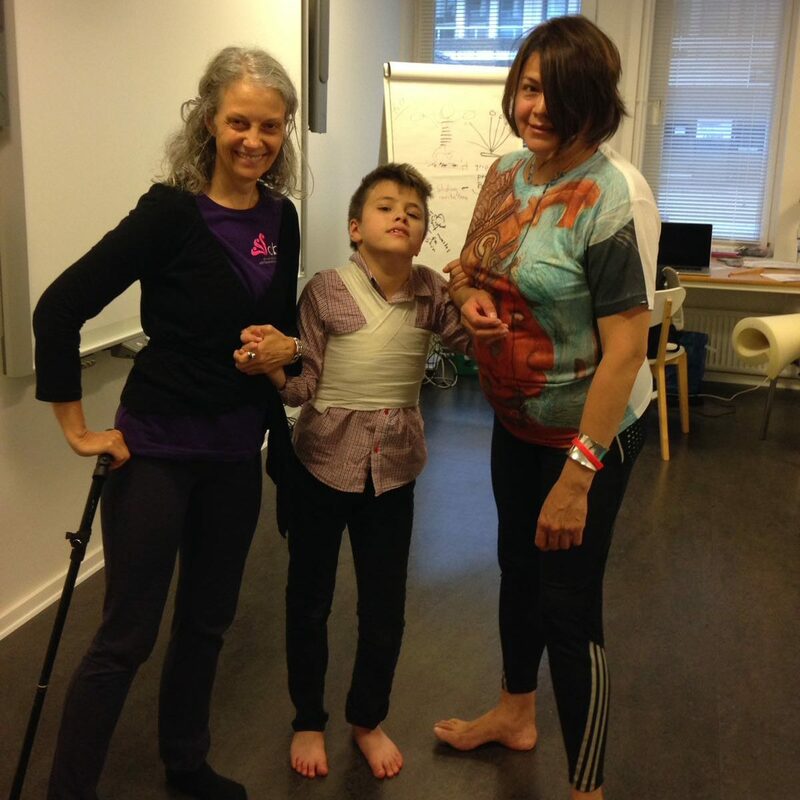 The special needs child has with an internal act of genius searched for ways to stabilize the head – or the pelvis/spine connections in the case of the feet – even if the attempt has not been effective and even if there are much more suitable ways of attaining head stability. For the ABR inspired – and what could be called Bio-tensegral Informed Understanding – it is clear that it will be necessary to assist the child with folded hands and/or contractures of the feet at higher levels of the body starting with the vertical connections – specifically at the spine – before one can expect to achieve a meaningful change in the positioning or usage of either the hands or the feet. Any stretching, injecting with nerve poisons, orthopaedic interventions or surgeries will only have a limited and short term effect if one cannot manage to address the problem at the root. On the other hand once the hands or feet have stiffened into a permanently poor position, they unfortunately become an additional liability for the child or affected adult. They have been trying to do the work of the weak neck or the weak pelvic connections for years and this has brought them into a state of permanent stiffening more commonly called spasticity. These spastic hands and feet however – do not allow the child to release any tensions generated through his daily life through the arms and legs. Normally a person can release an immense amount of tension through simply walking, doing something with the hands, or gesticulating when talking. 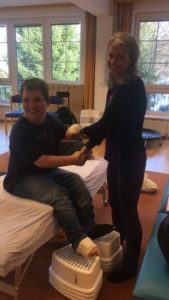 The hands and feet of the special needs child – instead of being able to move, dance in daily movement and release tensions – end up being tension collectors and return built up tensions to the overly tense body. A vicious cycle is implemented – and the child cannot exit on his own. It is here that the child need assistance from another side and he or she cannot bring this himself. ABR strategy – in this case – is not only to strengthen the vertical connections at the level of the spine, but to reduce the negative effect of the feet and hand tensions. Tensions that build up and cannot be released have a long term negative effect upon the individual – leading to further stiffening, further fibrosis of the tissues, further discomfort – and so it goes around and around. Newer ABR applications developed – like the power socks, the wraps, the Osteo-tapping, the “Reverse Squeeze” at the hands and feet – all these are designed to bring a release of tensions to the peripheral joints. The ABR children have now been rewarding the efforts of their parents with faster attainment and new levels of grasping objects, eating on ones own, using the arms for weight bearing, standing independently. We watch these improvements with joy and congratulate ABR families for their immense efforts! Now that it is Summer, we wish to remi nd all parents of children with some kind of walking function of the great value of the backwards walking in the sand for children with gait difficulties. 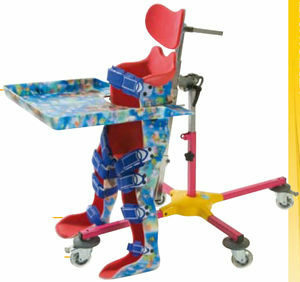 Whether they are walking with support or walking free, the backwards walking is the perfect active exercise for them! When walking forwards a child or an adult with gait problems tends to use the “falling tree” method for his momentum. Because the person cannot control the weight transfer through the foot, ankle and knee, he or she simply lets the upper body fall forwards and then catches up with the feet. This is not the correct sequence of activation for the walking. When walking backwards, this is not possible. 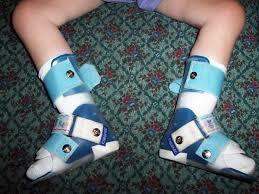 The child needs to lift the foot first, transfer the weight onto the leg. When walking backwards one needs to activate the step from the trunk, and the foot clearance is necessary. The trunk limb coordination goes in the correct sequence! Therefore – whether the child can walk backwards alone, or needs some support of one or two hands, walking backwards barefoot on the sand or in the grass if there is no beach, is the absolute best Summer exercise for your child. For those who need support – try to vary the support – sometimes give two hands, sometimes one hand – from the right or the left. We wish you a great Summer with the backwards walking style. Today’s world is a world of “specialists”. But there is at least one jewel of knowledge that even the poorest and the richest parents of special needs children share! The richest parents know it because they have traveled the globe searching for the best doctors that modern medicine can supply – and they have found out what the poorest parents know by default: That in the end, the parent is responsible for a handicapped child. The destiny of this child lies exhaustively in the hands of the parent in a more intense manner than that of any healthy child ever does. What ABR can do for all parents of children with cerebral palsy, brain injury, genetic illness and other disorders is to give a deep sense of reassurance that lies in the knowledge of the developmental potential of each person no matter how severe the illness. When you the parent become the driver of your child’s rehabilitation, your focus changes from “cure” to “development”. Improvements matter, each increment of change matters. You realize all this because it is happening under your own hands. You observe how small increments of change accumulate and one day begin to bring huge transformations! A “cure” does not happen from one day to another, but is a process that can occur over time. You start to see that the unique thing about human beings is that they develop – they can transform and that development is the most essential aspect of childhood – and even of adult life. It is a great tool – ABR Method – for child developmental promotion. Having this tool in your own hands as a parent, brings an immense satisfaction that ABR parents learn to cherish.